I picked up a new car last week. It’s nothing fancy or particularly special; just a Ford Fiesta, but I happen rather to like it. I have a weird bonding process with cars. Sometimes I get into a car and fall in love. Other times, I never really get that attached. This led to a conversation in the office last week about our first cars. I was able to openly admit that my first car – also a Ford Fiesta as it happens – broke my heart when we parted company. Some guy turned up to my house (I was living in Evesham at the time), paid me cash and drove away in my first ever car. I cried. I couldn’t help it. I’d had it for two years and we’d been through some amazing journeys and disasters together. This was the car that broke down at Leicester Forest East services and left me, to this day, with a fear of breaking down at that place. The old design meant that the accelerator cable rested in a clip on top of the air filter. My Big Brother had changed the air filter for me before I left for the drive to the Peak District, but not put the cable back in the clip. Thus, it spent the whole trip lying on the exhaust manifold. And comprehensively melted. I still remember the horrors of driving around Leicester on a rainy evening, trying to find somewhere to buy an accelerator cable, with Phil the Very Patient AA Man. I also remember Phil being remarkably startled when I bought him a coffee, saying that nobody ever did that for him. What was I meant to do? YOU JUST SAVED MY LIFE, MR. KNIGHT IN SHINING YELLOW VAN-TYPE ARMOUR! But it’s an odd thing how we form attachments to material objects. I’m sure most of us had a favourite toy when we were kids; you know, the one thing that went everywhere with us and woe betide if it were lost. Here’s a confession for you. I have a stuffed toy; a lop-sided, decidedly misshapen little dog who goes by the name of Smudge. Smudge and I have been together since I was about seven or eight years old. 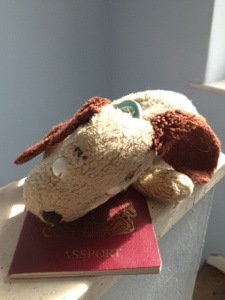 Smudge has been all over the world, because for years (I joked) I had massive paranoia that if I was away, my house might get burgled and Smudge dog-napped. Truth was, I am so attached to that little toy, that the thought of it being in the house whilst I’m away used to give me terrible anxiety that the house would burn down. Screw all my other possessions; this is the only thing I TRULY cared about. Smudge no longer comes on holiday with me. This is as a direct result of him being pulled out of my hand luggage the last time he travelled and being put through the scanner independently, presumably to be sure that I wasn’t smuggling drugs in him. I can see how mad I must have looked. A grown woman, lugging a stuffed toy around. I sort of smiled sheepishly at the airport security guy, muttering something about him thinking I must be a bit stupid only for him to then smile and say ‘don’t worry, I have this bear that goes everywhere with me’. So now, instead of house-burning down paranoia, I have worries that they’d cut him open and perform some kind of Smudge-ectomy on him. And that wouldn’t do. He may be battered, lop-sided, missing patches of fur and long ago lost the black pupils from his eyes (he now has this faintly terrifying, dead stare), but he’s mine. And I love him. And I DO love him. Is that a strange thing to admit? That I have love for a stuffed toy? That I loved my first car so much that I was able to cry genuine tears of separation when it left? I suspect that I love this toy so much because it represents a link to my childhood and a reminder of places I’ve been. It reminds me of the time I first got him; a single dog in a basket of similar dogs. He was the only one with an off-centre nose. He was the one who got the name ‘Smudge’ after my big brother whipped him out of my hands whilst we were up at my grandparents and threw him in the fireplace (the fire wasn’t lit – he wasn’t THAT mean) so he got all covered in soot. He’s the one who’s travelled to Florida, Los Angeles, San Francisco, Santorini, St. Lucia, Las Vegas and Rome. He should have his own passport. Alright. It’s a weird confession. So this is where I need you guys to help me out and reassure me that I’m not – ah – barking mad. (Pun re: dog stuffed toy entirely intended). What are your most cherished material possessions? Smudge. Intrepid explorer, trusted friend and protector of the Universe. When I was three months old, I was adopted. When my foster mother gave me to my parents, she also gave me a small blue teddy bear which was subsequently named Blue Ted. Now, almost 33 years later, Blue Ted has travelled with me almost everywhere. He’s had pride of place in every house, flat and student hall I’ve lived in. Even today he’s on a shelf in our bedroom, safely out of reach from the predations of our cat. Blue Ted is somewhat battered, his left led was temporarily amputated when I was five (thanks, little brother!) and his yellow neck bow is little more than a whisp of fabric, but I wouldn’t know what I’d do if I lost him. I have a little Penguin that was a gift about six years ago that has now followed me through several house moves out of sentimentality. My mum has me beat though, she’s got a teddy that her uncle gave her when she was two as well as her late elder brothers teddy. They were once a pair of majestic mohair bears but after nearly sixty years both are completely bald. So she knitted pair of teds matching cardigans. But no, I don’t think it’s just you. According to my mum I used to be attached to a video tape that I took everywhere, for example. But there are things that we don’t like to part with because we have memories tied to them. That’s why we read books that are one touch away from turning to dust or why we have an item of clothing or jewellery that we like to wear despite any tears, stains, tarnishing or defects. I’ve got a Japanese Transformer toy in my cupboard that I refuse to part with, because it was a surprise birthday gift from an online community I have long-since parted ways with (and not without some unreasonable guilt). So whilst it’s sat in my cupboard collecting dust and going forgotten for the most part, I know without a hint of doubt that I could not part with it. My 19 year old daughter has “brown bear”. He was in her crib waiting for her when my late wife and i brought her home from the hospital and the bear has gone everywhere with her ever since. He is family. I have had to restuff him him twice but he is so threadbare now that we cannot do that again. His eyes have been redrawn regularlywith Sharpie permanent markers.He has been attacked by the cat, drooled on by the dog and even survived the dryer several times. He has led a more active life than most animate objects. The only time that my daughter left him someplace that she wasn’t was when my duaghter slipped him into her mother’s hospital bed earlier this year when she was hospitalized for the final time. And “brown bear” worked to calm and comfort then. Now he is back at my daughter’s side and proving daily that he is magical in so many ways. That’s lovely. There is real power in loved toys.